Lawns, people love 'em or loath 'em. I'm not in the group that thinks all lawns are evil. There's a time and a place for grass. Lawns provide cooling effects, places to play and a spot for your eye to rest in the garden. But acres and acres of turf that only exists to be mowed, well there's gotta be something better. Actually there is, consider planting a bee lawn. What's a bee lawn? It's a less than perfect carpet, a combination of cool-season grasses and low-growing flowering plants that produce nectar and pollen for vital creatures like bees and butterflies. People used to have bee lawns but they just didn't know it. 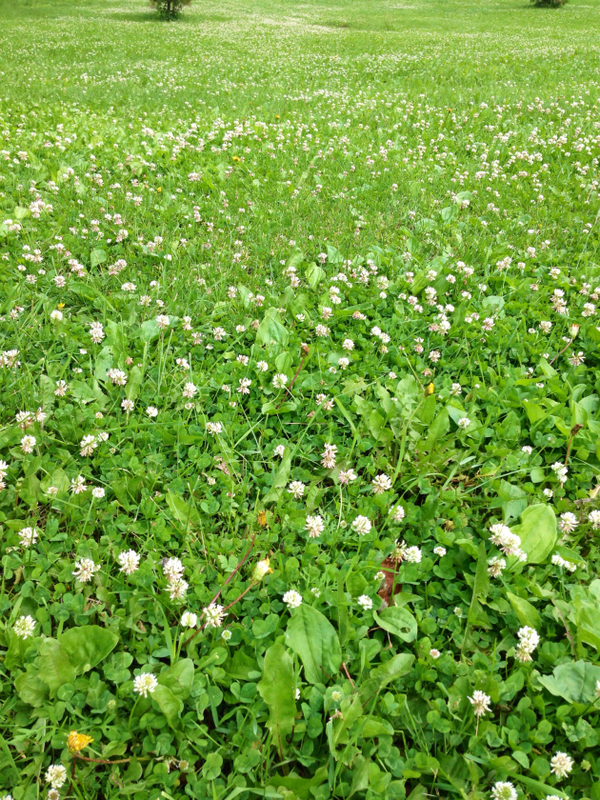 Before lawns received attention from lawn care companies they often were infiltrated with white clover, and tolerated. In fact, lots of grass seed mixes contained clover seed as well. The clover not only fed the bees, it produced seeds for birds. Clover increases nitrogen in the soil improving its health and decreases the need for fertilizer. Not bad, huh? Not every yard is a candidate for a bee lawn. But within every yard there might be a place for some type or small area for a bee lawn. Sloping areas where kids don't play sports or backyard areas that get little usage are good spots to try this sort of "turf". You could just leave the edges a little wild. 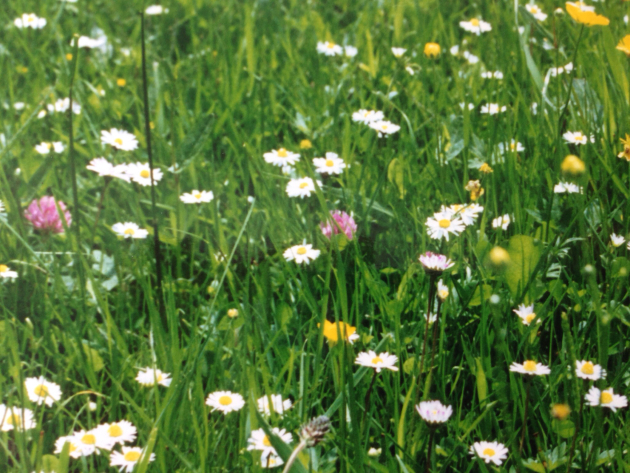 When I lived in England I was always fascinated by all the tiny flowers within our lawn that created a meadow effect. As you can see in this grainy photo there were small daisies, buttercups and clover. Rather than weedy, it was wonderful. Of course that was a milder climate, but there are hardier plants up north that might do the same thing. Researchers at the University of Minnesota Bee Lab are trying to develop a bee lawn seed mix that would contain low-growing, foot-tolerant, non-invasive, pollinator-friendly plants. Their hope is that it could be used in places where traditional lawns still are the preferred look, like cemeteries, commercial landscapes and golf course edges. Bee lawns would also reduce the need for water, pesticides and fertilizers. Meanwhile you could create your own bee lawn by overseeding the area with white or alsike clover. Simply letting your lawn go will not give the same effect. You might get a situation that could be described as weeds without benefits (to the bees). Once your bee lawn is established, make sure to mow high enough to avoid cutting off the buds and flowers. Learning Garden Tour! Save the Date! Rhonda Hayes is a garden writer, photographer and blogger. She also volunteers as a Hennepin County Master Gardener. Rhonda chronicles her gardening adventures and advice at her award-winning blog, The Garden Buzz. She is a frequent contributor to Northern Gardener magazine and the Star Tribune Home + Garden section. At Your Voices, she writes about life around the city lakes, occasionally veering off the garden path with essays on the silly and serious issues of the day. Signing off ... with gratitude. And to think so many homes share a similar situation that could be put to use as edible landscape. Funny that stores loaded with countless options can still leave us with a dearth of ideas. The soundtrack of summer is fine with me. Holding summer's harvest-plenty and so much more.